Great tasting Veggie Gummy bears with an ingredient blend of Organic Tomato, Beetroot, Parsley, Carrot, Turmeric, Kale, Broccoli & Spinach. Blend of Organic Spinach, Beet, Carrot, Broccoli and other natural veggies. Lunch Box Friendly packaging also available. 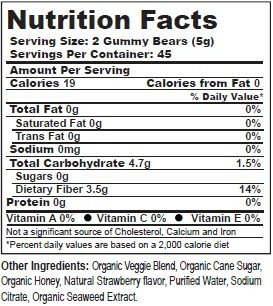 Dosage :- Take two gummy bears every day. Chew thoroughly before swallowing.